I’ve been married to my husband for 5 years and 5 months. And I thank God for each day we have been through together since then. For years I closed my heart. I avoided dating. I proofed myself that I didn’t need a man in my life. I though that was the best way for not be sad because of broken heart. I was scared. When I came to know Christ when I was at collage 2002, I was still afraid. I prayed for someone that He had for me and me for him. And prayed. And prayed. There was someone. But after dating for few months and prayed, we felt that we were not meant to be together. I waited again. And prayed again. This time I told God that I was all His. I didn’t care to be single for him as long as I got to do what He has called me to do, as missionary. Looking back those years lead me to thank God for the waiting time & for the broken heart. Today I am thanking God for my husband. It was worth it to wait for him. God opened my eyes to see these godly qualities and values in Dave’s life, not the worldly ones that every girl’s dream about. Our marriage is the most beautiful unity in Christ Jesus. He loves God above of anything in his life. And because of his love to God, he reflects that love to me and our daughters. 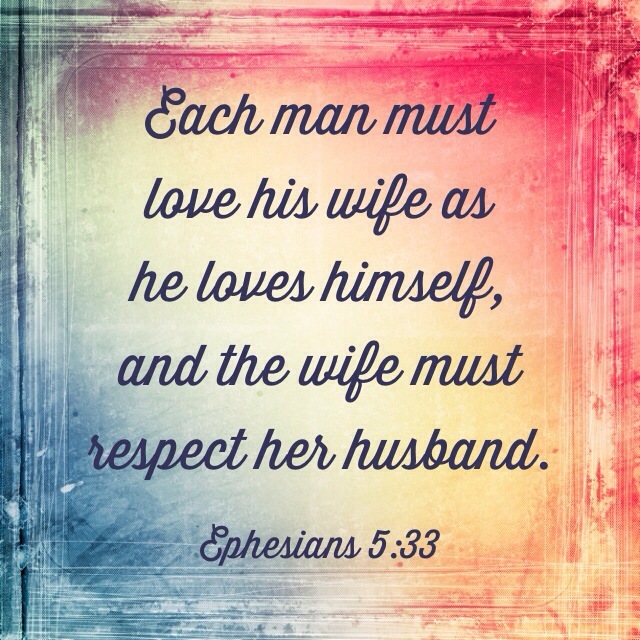 God uses my husband to teach me, to guide me, to help me and to show me who God is in our every day life. He sets example of trusting in God and how to walk in faith. 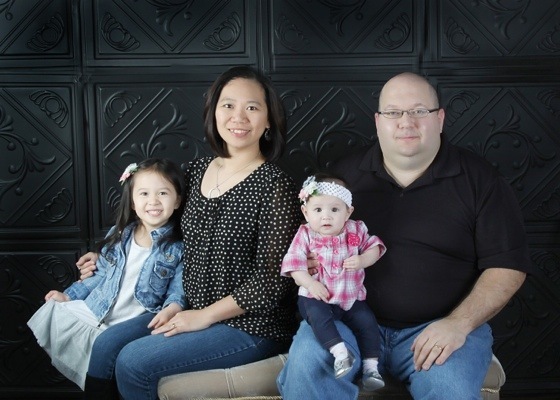 God has been blessing us through him as a husband and a father. God calls me to respect him, to love him as I love Christ, to help him and be strong for him. God calls me to be the mother to his daugthers. God has put me in his life and him in my life because He meant us to be together and serve Him together as family. It is God who unites us. That is the beauty of marriage. We are united by God. We are led by God. We love each other to reflects God’s true love. We respect each other in Christ Jesus. We are called to serve as family. What I was looking in a man before I was not a follower of Christ, they are emptiness and useless. They are not what God has for me. But He led me to the one and only He had prepared for me, and prepared me for him. How about you? What are you looking for in a man whom you will be living with for the rest of your life? which he carried out through Christ Jesus our Lord. 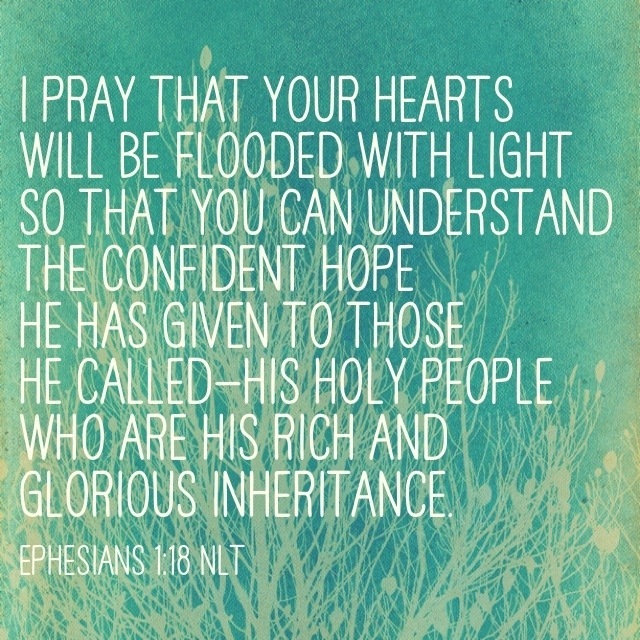 (Ephesians 3:11 NLT)God’s plan is eternal for He himself is eternal God. His salvation plan is for eternal. Can you imagine that if God ever had set a certain time for everyone to repent? I would be lost. Thankful that He is so patient with us & waiting for everyone to repent and be saved. 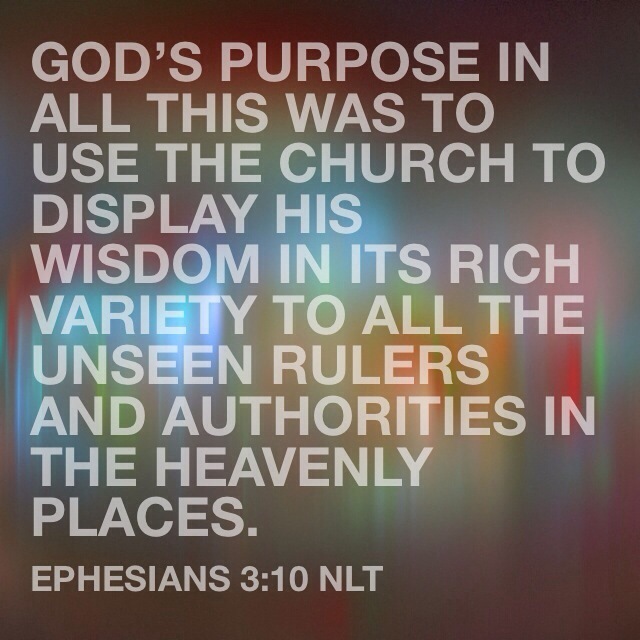 God has planned us, His Church, to GO, SHARE the Gospel & DISPLY God’s wisdom to the world. Often we feel safe & comfy just being in the church, don’t want to step out of our comfort zone. Honestly, I feel safe for my kids to just be in church environment & Christian communities all the time so they won’t sin. But how do I know what is exactly in their hearts? But God know. Can I know what they will do before hand? no! But God can. He has their future in His hands & He is the one who plan their lives. I cannot control the future but He does. What I am trying to say here is that keeping ourselves away from the world (we are still lhere, on earth!) is not gonna keep us holy and righteous. 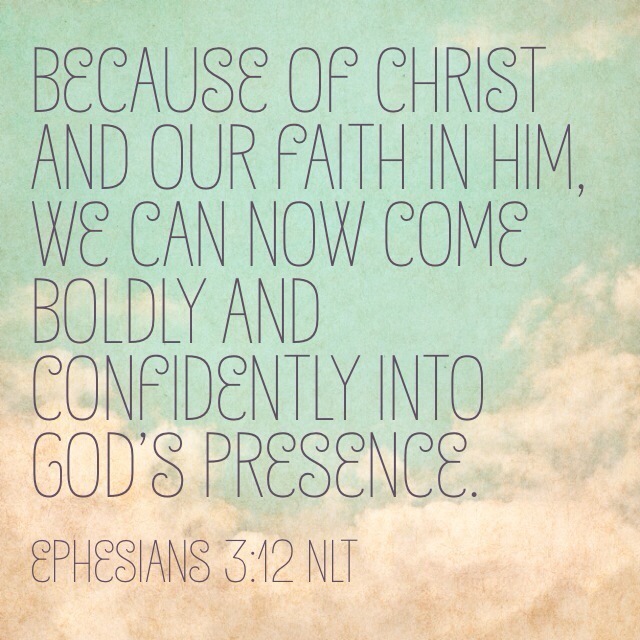 God himself with His grace who saved us from who we were before (Ephesians 2:11-12). God makes us holy. God makes us righteous. God makes us who we are in Christ. And he has a purpose when He call us , adopt us into His family, saved us. He has planned for us to go, share the Good News with the world, and display His wisdom & love to the world so that they may know who He is. If we just be in our comfort zone all the time, then how these unsaved, unreached people will know who God is and what Jesus has done for them? – Through Christ, I have the way to Go to the Father (John 14:1-14). That is absolute promise of God. – God give me the Holy Spirit (John 14:15-30), the One who will pray foe us in our weakness according to the will of God (Romans 8:26-30). That is the work of the Holy Spirit in us, believers. Don’t you just love how He KNOWS each of us so well and know exactly each of our need right now? Oh Yes He always answers you every time you seek Him,talk to Him and wait for His answer. And…one more reminder for me and you…. Yes I often lose heart when I was in trials. God command me not to lose heart in the battle for He is with me and it is all for the benefit of His glory and others to come to know Him. Our sufferings and trials are for His glory to be made known. 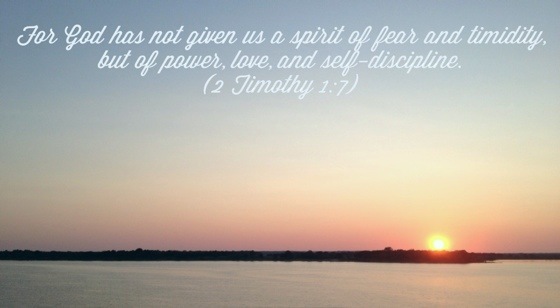 In our weakness, God is there and He reveals His power for the others to see that God is God, the sovereign One. I cannot stand by myself in the trials, and for that I really need YOU to pray with me and for me, so I can stand in His promises! Would you be praying for me? 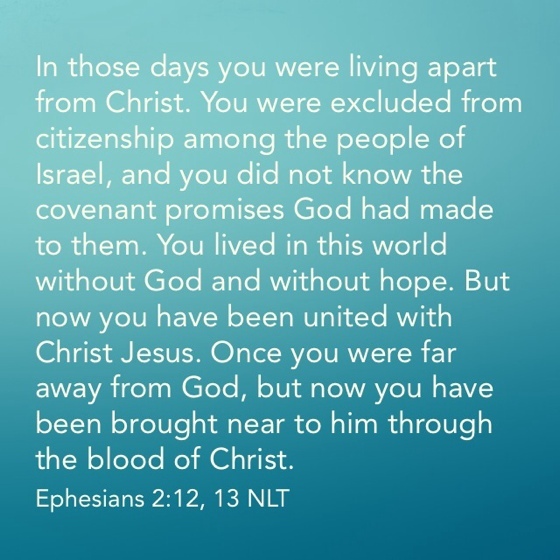 I lived apart from God. God made Christ Jesus to be our peace. He came and preached the peace to us. He made Jesus the cornerstone. I am saved and redeemed. I am bought by the blood of Christ. I am part of His family. I am an insider in His kingdom. I can go to God the Father through Christ in the Holy Spirit. You are saved and redeemed. You are bought by the blood of Christ. You are part of His family. You are an insider in His kingdom. You can go to God to the Father through Christ in the Holy Spirit. Today, I link up this post at HelloMorning blogs and you can find more encouraging posts from what God has taught them through reading of His word in the book of Ephesians. Up until now I still cannot figure out what’s the next step for us to take in this Partnership Development journey. I just know that this journey we have been taking since 16 months ago is not as easy as we thought. Not knowing the certainty of our next steps really bugs me a lot. Then this verse came back to me since couple of days ago. God reminded me that his plan for me and my family. That He never ever forget, nor forsake, nor abandon us. He is the one who gives us the desire to serve Him as missionaries and supporting Bible Translation works. He is the one who leads us to where we are now. He is the one who put this plan in our lives. He is the one who will work it out. For He is the one and the only one who can make it happen. For His faithful love in our lives. In a 2 hours I will be go to a ladies’ retreat with my ladies friends from church at Scioto Hills Christian Camp, we will be rejuvenated, refreshed and reconnected with God. I pray for His new revelation of Himself to me and all the ladies.